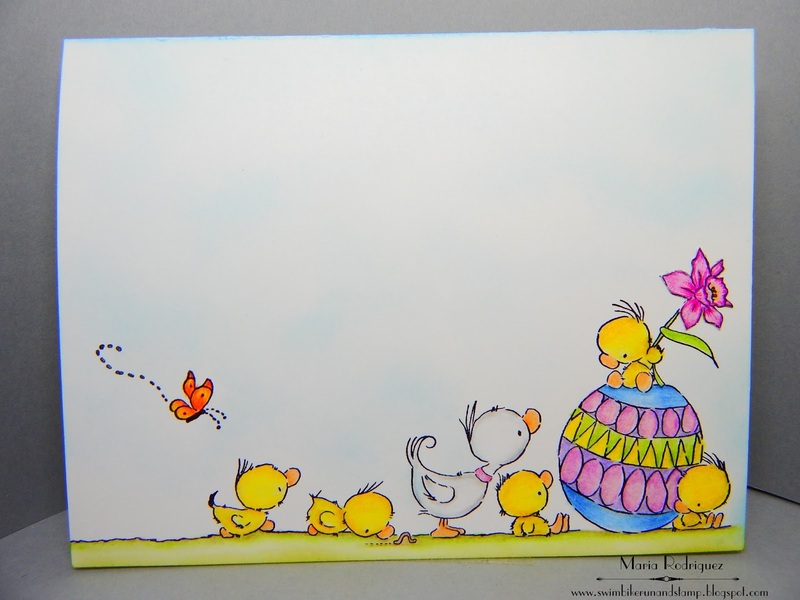 Hello every one: I've got this cute little Easter card to share with you, I will play along with a few challenges at the end of this post. 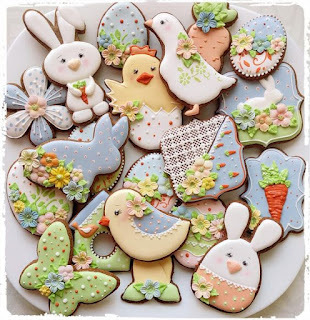 This is an image from Lili of the Valley but I think it's discontinued, I couldn't find it to give you the link, so sorry. 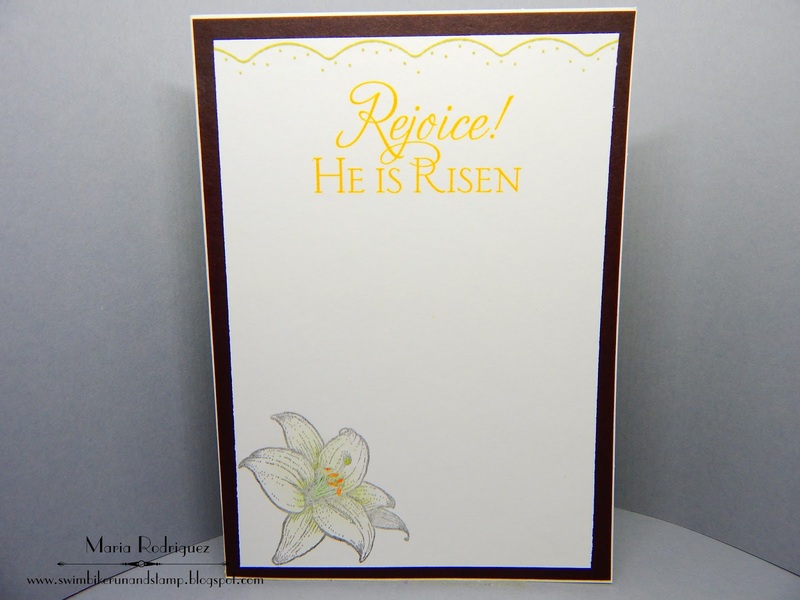 I stamped it on a folded Whisper White card stock from SU with Stazon black ink and colored it with Prismacolor pencils and paper stumps dipped in Gamsol. I sponged a little Tumbled Glass distress ink for the sky and Shabby Shutters for the grass. 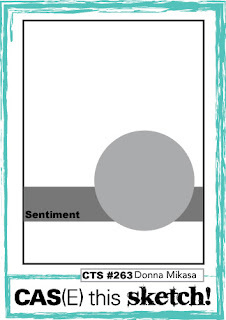 The sentiment is from my old stash of unknowns, I love the font. The flower is from the same image as in the front, I inked the flower only with SU markers and lightly went over it with a damp brush. 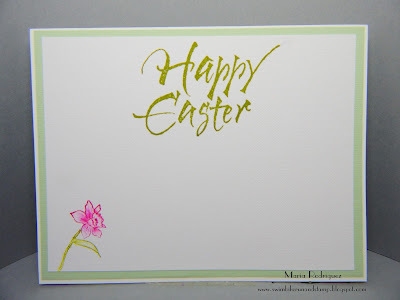 "Favorite Easter Character and Why?" 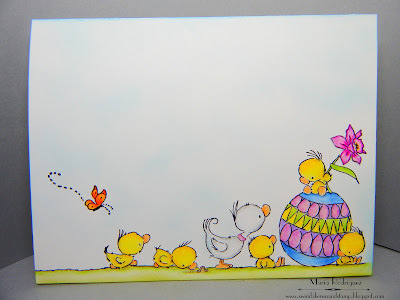 I love the little Easter Duckies, they are just so sweet with their bright yellow fluff. 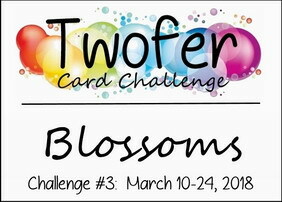 Moving Along With The Times Challenge #67 "Easter"
Hello dear blogging friends: Here I am again with another pair of cards for the Twofer Challenge in which you have to create two cards, totally different, for two separate occasions using the same stamp set, die or punch, this time around the theme is "BLOSSOMS". 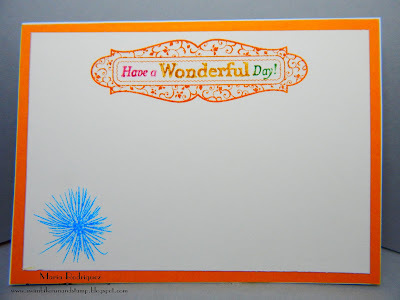 I used one of my most favorite Stampin' Up! die sets called "Botanical Blooms" (sadly retired) to create this cards. The pattern papers on the Christmas card are from a discontinued line from Lili of the Valley, the word "Merry" was die cut with a Penny Black die set called "Love and Joy". 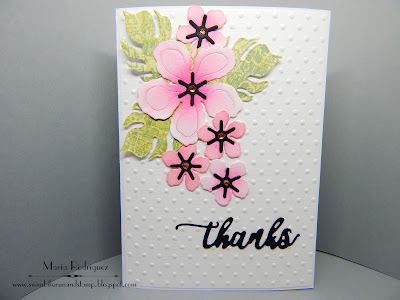 For the second card, I used white card stock and the same dies for the flowers, I sponged them with distress inks. I put some Rhine Stones on all of the flowers to add a bit of bling. This is how the INSIDE of my cards look like. 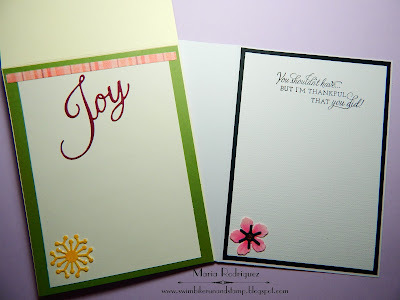 The "Joy" word is from Penny Black, the sentiment on the second card from a retired Flourishes set called "Season of Thanks". 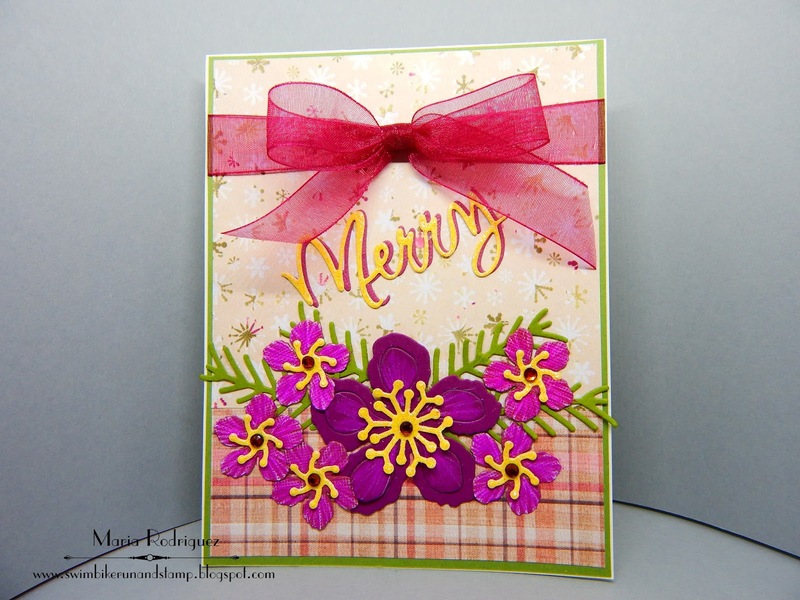 This challenge is so much fun, I've said it before, it really makes you work and think to come up with your designs, which is great for our creative brain so, thank you Darnell and all the Twofer DT gals for all the wonderful inspiration. 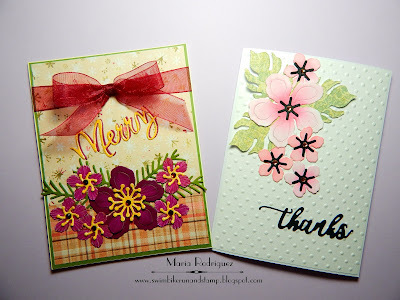 Die Cuttin Divas Challenge#361 "FLOWERS"
The Holly and Ivy Christmas Challenge #25 "Anything Goes Christmas"
Dream Valley Challenges #175 "Spring Colors"
Hello everyone: The SHOPPING OUR STASH challenge has a new one for you to play with this coming week, the theme is EASTER. Time sure flies and, before you know it, IT will be here so, this is a great opportunity for you to start creating some cards to send out to family and friends. Here is mine and I hope it will inspire you to come and play along. 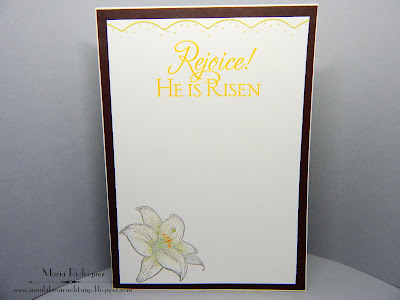 This image is from an old Flourishes stamp set called "He is Risen", I inked it with Stazon black ink and stamped it on a die cut panel of watercolor paper, colored it with a Derwent brown watercolor pencil for the Cross and SU markers in Daffodil Delight for the centers of the flowers and Certainly Celery for the petals, the leaves were colored with Always Artichoke and the little flowers with Pink Pirouette, the sentiment is from the set, the patter paper from Lili of the Valley (retired line), the ribbons are from my stash. 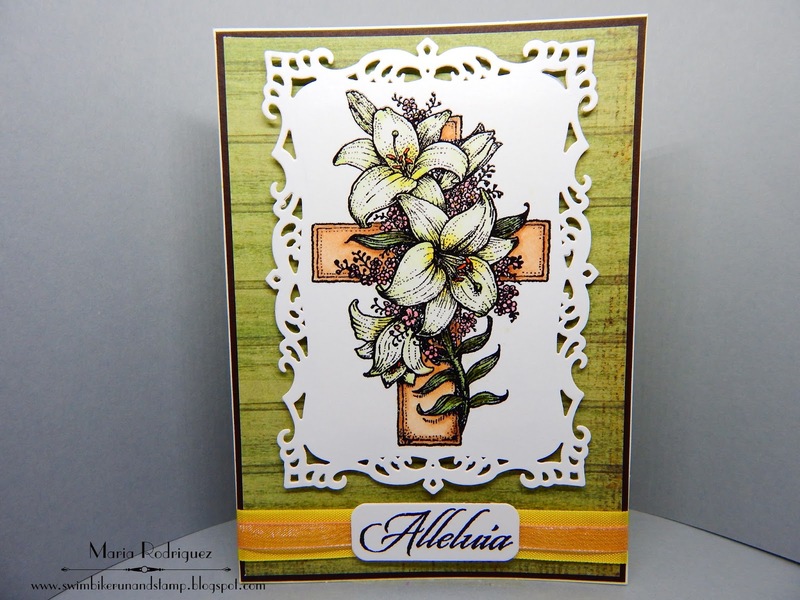 The border is from a SU set called Delicate Details, the sentiment and the corner flower are from the same set as in the front. 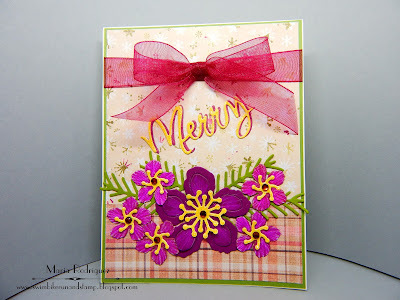 I hope you get inspired and come to play along with us at SHOPPING OUR STASH, make sure you stop by the blog to get more inspiration from my teammates beautiful creations. 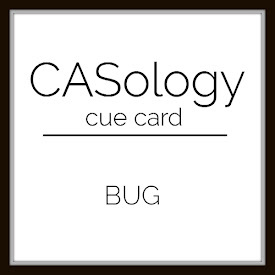 Hello dear blogging friends: I'm quickly joining the CASOLOGY challenge hoping my card makes it in before it's too late. 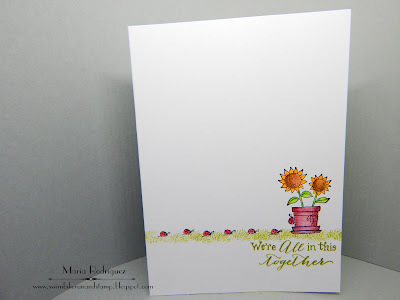 I used a very old and cute stamp from SU called "A Flower for all Seasons" (2008-2009 retired). This image has this little Lady Bug crawling on the side of the pot. 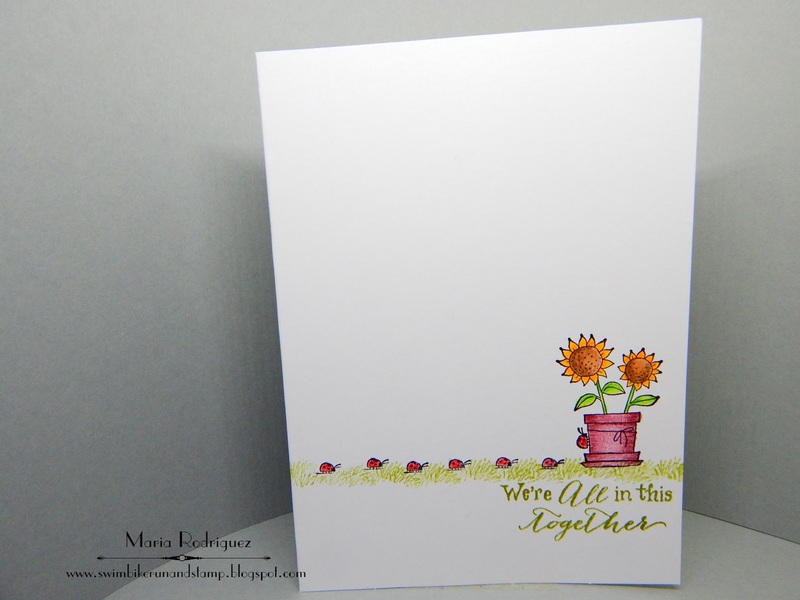 I wanted to follow the sketch from CAS(E) this Sketch so I created a line of grass and stamped the little Lady Bug on it using my MISTI. I colored this images with Prismacolor pencils. The border is from a SU set called "Delicate Details", the sentiment is from a Power Poppy set called Sassy Succulents and the little image on the corner, from the same SU set. The little butterfly was stamped to cover a little smudge of black ink, sheeesh!! don't you hate when this happens??!!! You have your panel finished, it looks great and then.....BAM!! a darn smudge😨😩😠😡😤, but this little butterfly image from a retired SU set called "Furry Folk" (2011-2012) came to the rescue, phew!! 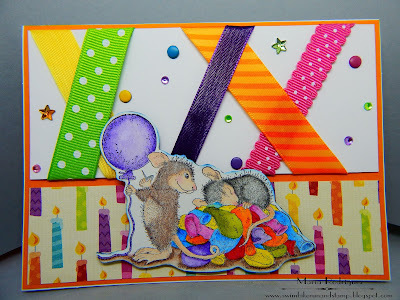 Hello dear blogging friends: Today is my last day as the Guest Designer for the HOUSE MOUSE AND FRIENDS MONDAY CHALLENGE. You know how much I love the House Mouse sibblings so I had a blast creating my cards with the adorable images of this little critters that are so very dear to me and, as you can see on this card, they can be as sweet as they are MISCHIEVOUS!! The challenge this time is "Anything Goes with an option of Ribbons" so, this is a good chance for us to use all of those scraps that we can't seem to throw away. I often find inspiration on Pinterest and this time, I hit the Jack Pot!! 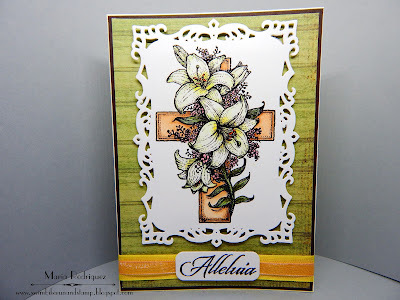 I found THIS FABULOUS CARD by the very talented Hannelie Bester, her blog Desert Diva is one of my most favorites when it comes to amazing CAS cards. I have this birthday pattern paper sheets on my stash so I decided to go with the colors of the candles to pick the ribbons and to color the balloons. Every time I use this image, I can't help but smile and the total mischievousness of this little mouse just about to wake up his sister with a BANG!! 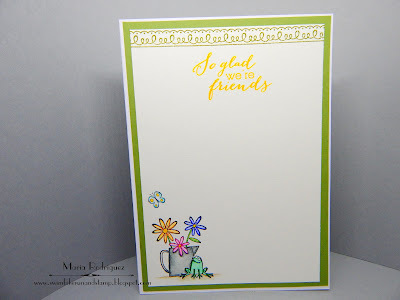 I stamped the image on some watercolor paper with Stazon black ink and colored with Sakura Koi watercolors and Prismacolor pencils, I fussy cut around it and popped it up with some fun foam. I placed some Rhine Stones, Candy Dots and a few stars for some bling. The sentiment is from Penny Black and the fireworks from The Ton "Pyrotechnics" stamp set. 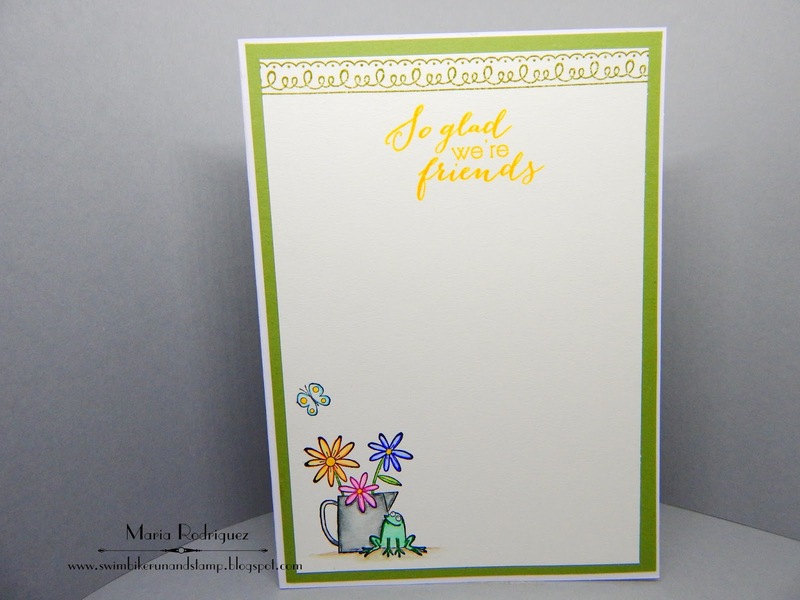 I hope you stop by the HOUSE MOUSE AND FRIENDS MONDAY CHALLENGE to see the amazing cards from the other Guest Designers and the fabulous Design Team and join in the fun, there are some fantastic prizes for you to win.